Impress your friends with this "South of the Border" favorite. Easy and delicious custard with a caramel topping. 1. Pre-heat oven to 300 degrees. Line a roasting pan or 8x8-inch baking dish with a thin kitchen towel. Generously grease the insides of 4 individual 10-ounce ramekins with butter. 2. 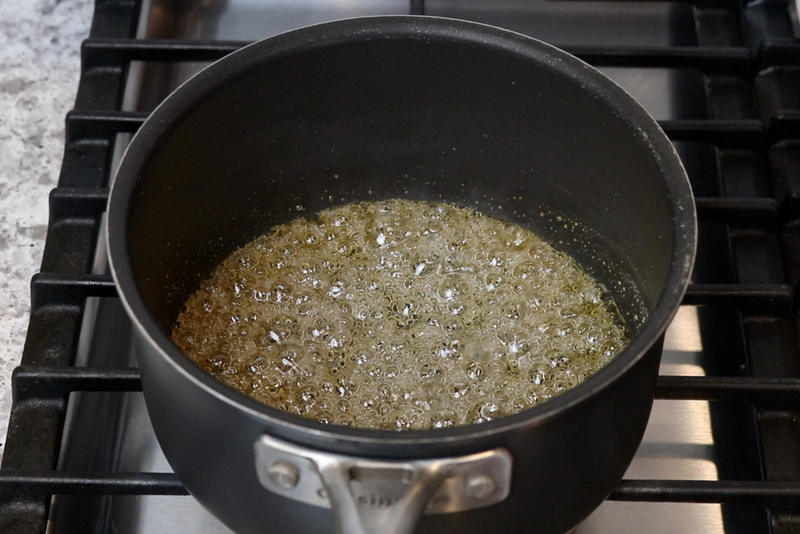 In a medium heavy saucepan, stir together sugar and water until incorporated. 3. Bring to a boil over medium heat. 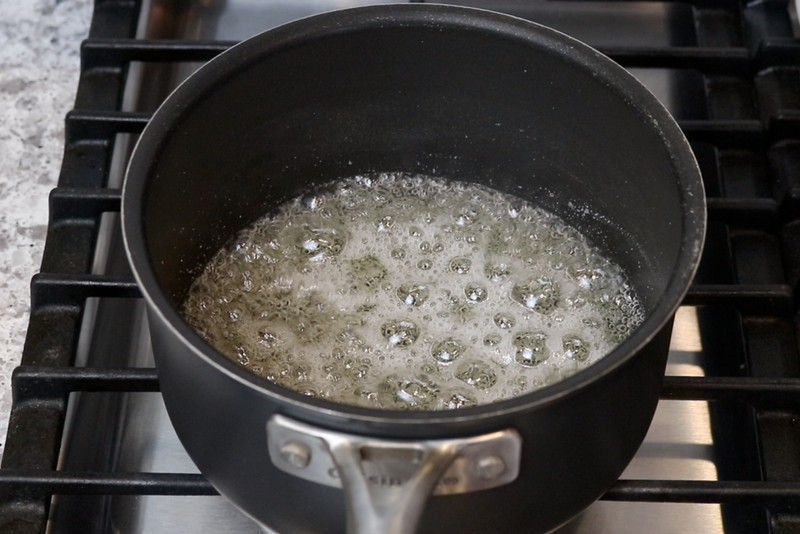 Let mixture boil for around 5 minutes without stirring. 4. Turn heat up to medium-high. When mixture starts to turn golden brown turn off the heat and swish mixture around. 5. Add the water and keep swirling until the mixture stops bubbling violently. 7. 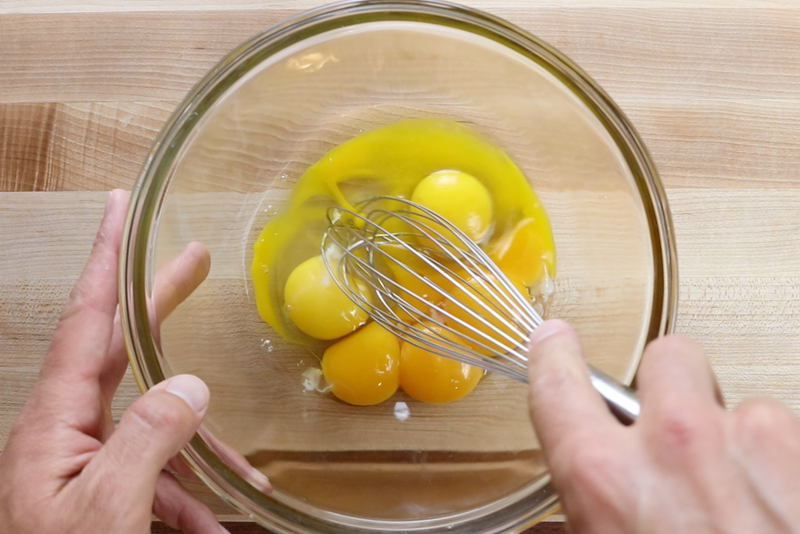 In a large bowl, whisk the eggs and yolks together. 9. Pour an equal amount of the egg mixture through a small fine mesh strainer into your ramekin cups. The strainer will catch any un-whisked pieces of egg. 11. Bake for 70-80 minutes. The custard will be set on the outer rim, but still jiggle in the middle. Let cool for 30 minutes in baking pan. 13. 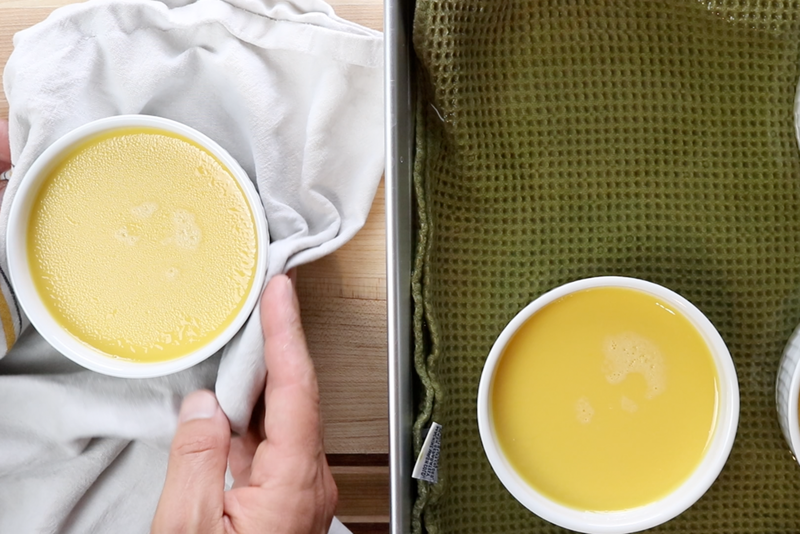 When ready to serve…unmold the flan by using a sharp knife around the outer edge. 6. Pour the caramel sauce equally in to the 4-10 oz ramekins and set aside. 8. Add the sweetened condensed milk, evaporated milk, half and half, vanilla and salt. Whisk until incorporated. 10. 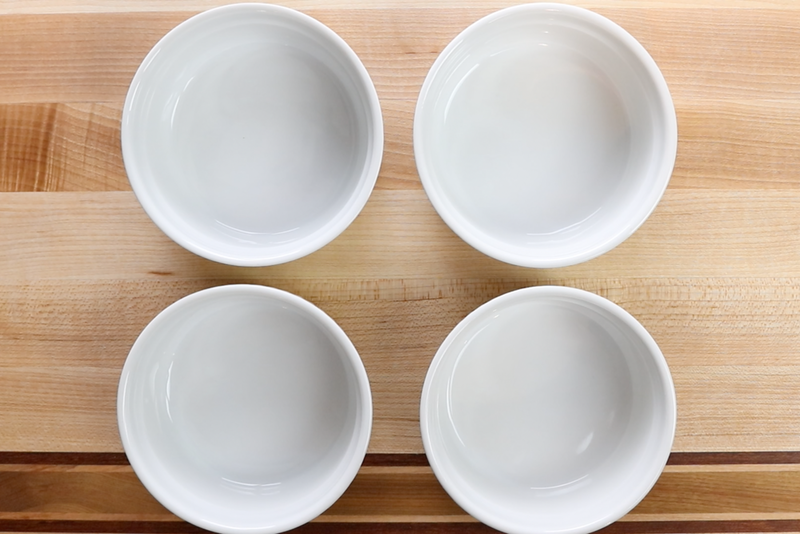 Place the ramekins in the 8x8-inch baking pan to make a water bath. Pour hot water around the ramekins until it reaches about halfway up the sides of the pan. 12. Remove ramekins from baking pan and wipe them dry. Cover with plastic wrap and chill in the refrigerator overnight. 14. Place a small saucer or a plate with a lip on top of the flan face down, then turn the ramekin and plate over. The flan should slide out within a minute. If not try to loosen the edges again with the knife. Impress your friends with this "south of the border" favorite. Easy and delicious custard with a caramel topping. Be sure to make this dessert ahead of time! 1. Pre-heat oven to 300 degrees. Line a roasting pan or 12x12-inch baking pan with a thin kitchen towel. Generously grease the insides of 4 individual 10-ounce ramekins with butter. 4. Turn heat up to medium-high. When mixture starts to look golden brown, turn off the heat and swirl mixture around. 10. Place the ramekins in the 12x12-inch baking pan to make a water bath. Pour hot water around the ramekins until it reaches about halfway up the sides of the pan. 11. Bake for 70-80 minutes. The custard will set on the outer rim, but still jiggle in the middle. Let cool for 30 minutes in baking pan. 13. 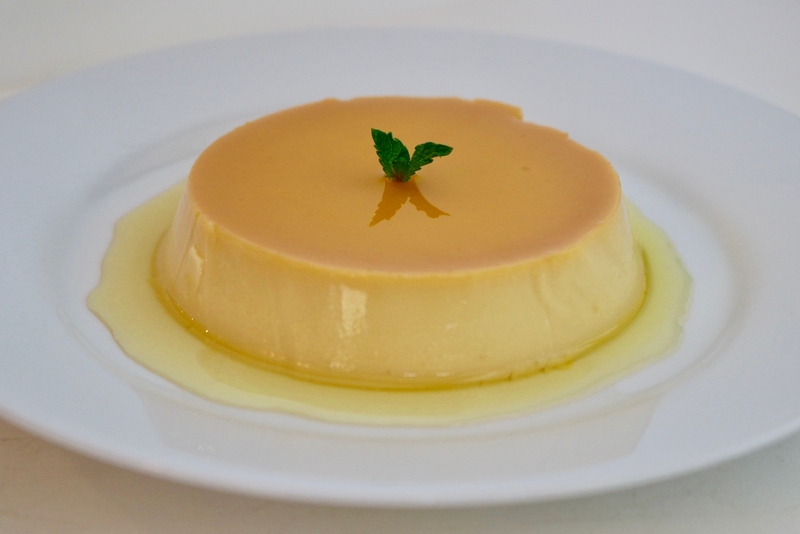 When ready to serve…unmold the flan by using a sharp knife around the outer edge. Place a small plate with a lip on top of the flan face down, then turn the ramekin and plate over. The flan should slide out within a minute. If not try to loosen the edges again with the knife. 14. Scrape remaining caramel out of the ramekin and onto the flan. Serve immediately. *Flan will keep covered in plastic for up to 4 days in the refrigerator. *When making flan, plan ahead by a day or two.